Baloji is an artist in motion, a musician, poet, film director, a man of images and ideas. He’s in motion like the inhabitants of Avenue Kaniama in Lubumbashi. In motion like the synthetic afro beats he produces, the fruit of an unlikely alliance between rock-rumba and futurist funk. In perpetual motion, like his limbs on stage as he fronts the Kaniama Show band, leading them in a sensual voodoo trance. In motion like the era captured by his pen, an era where the intimate and the political come together and clash. 137 Avenue Kaniama is Baloji’s third album and the first to appear on the Bella Union label (John Grant, Fleet Foxes, Beach House). Baloji means “man of science” in Swahili, but during the colonial period, that meaning shifted as a result of Christian evangelisation, to signify “man of the occult sciences” and then “sorcerer”. Baloji was born in Lubumbashi (DRC Congo) and grew up in Belgium. As a teenager, he started his first rap collective, Starflam. In 2008, as Baloji, he released “Hotel Impala” an album conceived as a reply to a letter he received from his mother after a 25-year absence. 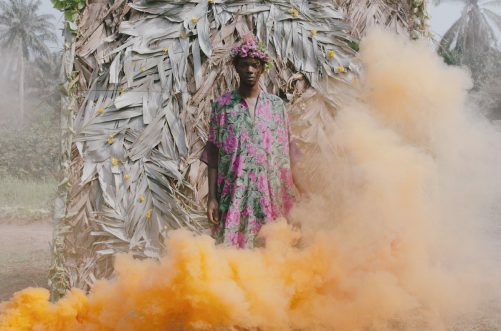 Baloji directs his own videos and the creates the visuals for his varied projects. His first short fiction film, “KANIAMA SHOW” was released in March 2018. It takes the form of a satire on African propaganda TV shows. His first feature film, for which he has written the screenplay, is planned for 2019.